Dr. Ebihara is studying the biophysical and pharmacological properties of gap junctional channels in the lens of the eye and other tissues. The lens is a transparent, spherical organ whose main purpose is focus light on the retina. It is highly dependent on intercellular communication for volume regulation and metabolic homeostasis. There have been three types of gap junctional proteins (connexins) identified in the mammalian lens: Cx43, Cx46, Cx50. One of the current areas of interest in the field of eye research is to understand how these gap junctional proteins contribute to lens homeostasis and how cataracts arise. It has been recently shown that mutations of lens gap junction proteins are associated with certain forms of inherited congenital cataract. Furthermore, targeted disruption of the genes for either Cx46 or Cx50 result in the development of cataracts in mice. 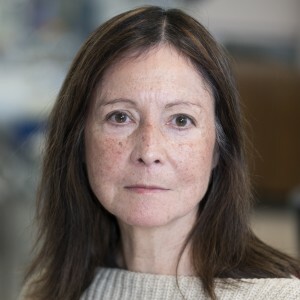 One of the major aims of Dr. Ebihara's research project are to obtain a more detailed understanding of the biophysical properties of cloned lens gap junctional proteins and to localize the molecular determinants of permeability and gating of the gap junctional channels. Another aim is to examine the functional consequences of mutations of Cx50 and Cx46 found in congenital cataract patients. The techniques employed in these studies include: expression of cloned proteins in the Xenopus oocyte expression system and communication-deficient mammalian cell lines; two-microelectrode-voltage-clamp and patch clamp studies of macroscopic and single channel currents; other molecular biological techniques such as site directed mutagenesis; immunoblot analysis. Tong JJ, Minogue PJ, Kobeszko M, Beyer EC, Berthoud VM, Ebihara L. The connexin46 mutant, Cx46T19M, causes loss of gap junction function and alters hemi-channel gating. J Membr Biol. 248:145-155, 2015. Ebihara L, Korzyukov Y, Kothari S, Tong JJ. Cx46 hemichannels contribute to the sodium leak conductance in lens fiber cells. Am J Physiol Cell Physiol. 306:C506-513, 2014. Tong JJ, Sohn BC, Lam A, Walters DE, Vertel BM, Ebihara L. Properties of two cataract-associated mutations located in the NH2 terminus of connexin 46. Am J Physiol Cell Physiol. 304:C823-832, 2013. Beyer EC, Ebihara L, Berthoud VM. Connexin mutants and cataracts. Front Pharmacol. 4:43, 2013. Tong JJ, Minogue PJ, Guo W, Chen TL, Beyer EC, Berthoud VM, Ebihara L. Different consequences of cataract-associated mutations at adjacent positions in the first extracellular boundary of connexin50. Am J Physiol Cell Physiol. 300:C1055-1064, 2011. Ebihara L, Tong JJ, Vertel B, White TW, Chen TL. Properties of connexin 46 hemichannels in dissociated lens fiber cells. Invest Ophthalmol Vis Sci. 52:882-889, 2011. Minogue PJ, Tong JJ, Arora A, Russell-Eggitt I, Hunt DM, Moore AT, Ebihara L, Beyer EC and BerthoudVM. A mutant connexin50 with enhanced hemichannel function leads to cell death. Invest Ophthalmol Vis Sci 50:5837-5845, 2009. Arora A, Minogue PJ, Liu X, Addison PK, Russel-Eggitt I, Webster AR, Hunt DM, Ebihara L, Beyer EC,Berthoud VM and Moore AT. A novel connexin50 mutation associated with congenital nuclear pulverulent cataracts. J Med Genet 45:155-160, 2008.